The Ultraskiff can also be transported on a Cargo Carrier or a Wheel Chair Carrier that has a ramp attached. The economical Harbor Freight Wheel Chair Carrier with the detachable ramp is the ideal choice that I currently use. The ramp is detachable by using the bolts and a couple cotter pins to take it on and off. There are many different brands and types of wheel chair carriers on the market, a simple internet search can reveal ones that fold up on your hitch. I zip tied a couple of external trailer lights to the rear of the carrier. To secure the Ultraskiff to the carrier I run 2 ratchet straps through the center hole to secure and attach them to the strap rings that come with the carrier. 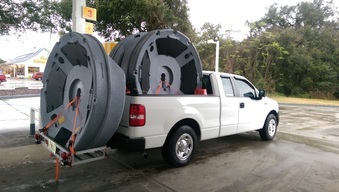 Running additional straps through the molded tow ring can help in adding additional security. 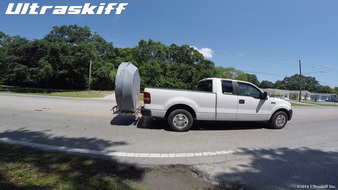 Watch our Video where we demonstrate it with the Ultraskiff.